Champoeg State Park. St. Paul, OR | Discovered ... Right Here! When you and your sister both have an early summer Monday off, you have to go do something. But what? It was a weekday and a workday, notorious for being a day popular attractions are minimally populated. Opportunities abounded. We thought about going to Horsethief Lake in Washington, but decided that it was too far away for the day’s adventure. We considered going shopping at Washington Square mall, but I didn’t have anything I needed to buy. 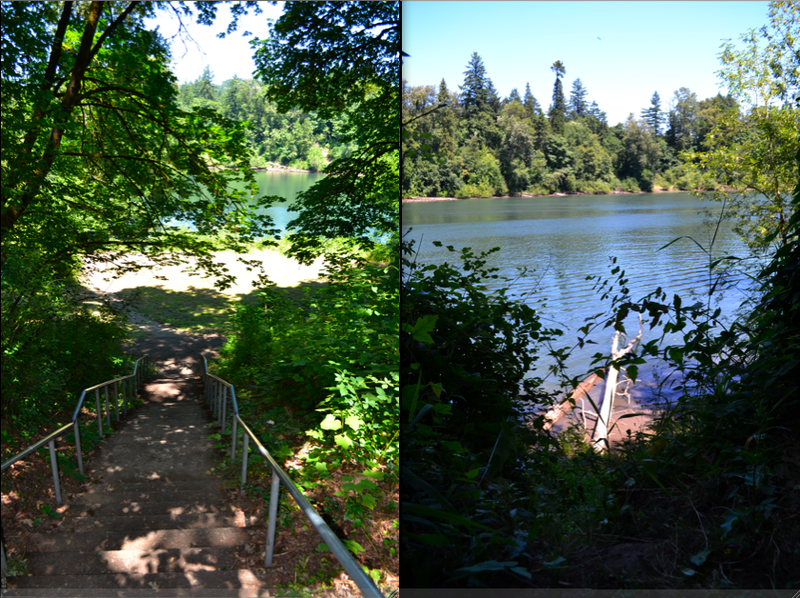 We contemplated the beach, but decided instead to go hiking around Champoeg State Park, just outside of St. Paul, OR. 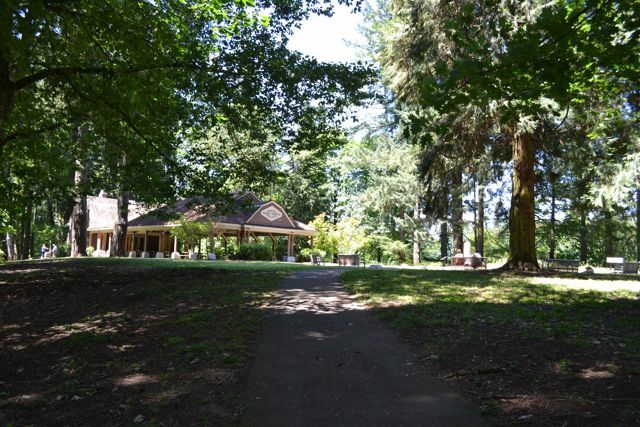 The area now known as Champoeg (pronounced: sham-poo-ee) Park was once known as tchnampuick and inhabited by the Tualatin Kalapuya tribe until the early 1800s when French-Canadians from the Hudson’s Bay Company retired here. 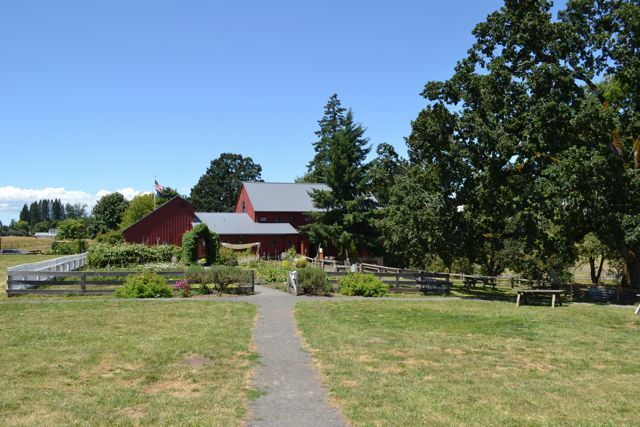 After stopping in at the Visitor’s Center, buying the $5 parking pass, looking around at the free exhibits and meandering through the 1860’s-style kitchen garden, we drove to the east side of the Park. There we wandered around the Riverside day use area and along the easy Pavilion Trail. Champoeg Park Pavilion and Monument Plaza is where farmers and trappers voted for a Provisional Government in Oregon on May 2, 1843 at a “meeting of the ‘inhabitants of the Willamette settlements’.” This vote formed “the first American government on the Pacific coast.” Later, in 1900 the land was purchased by the State for a public park, and to commemorate the vote the State erected a monument here. With the breezes through the evergreens, sunlight penetrating the clearing like a monument spotlight and happy boater laugher floating off the river, just sitting on benches made for a relaxing summer afternoon. The back history told me I was not alone in enjoying this spot. This location has hosted many happy moments. 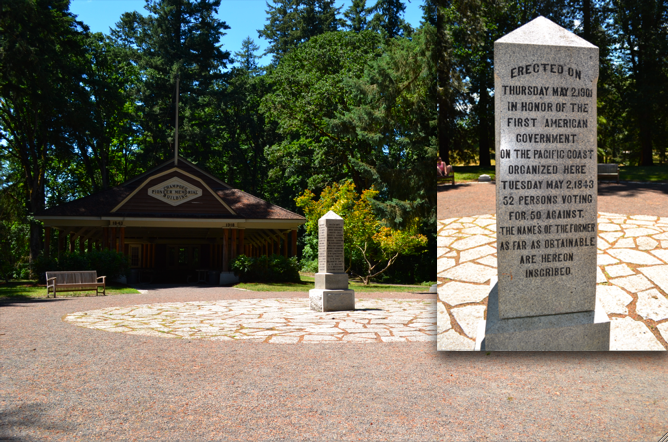 Back in the day, Champoeg was called the “Plymouth Rock of the Pacific Coast,” and every May 2nd citizens would gather to celebrate. The Pioneer Memorial Building was built in 1918 and the attached covered area was added in 1920, providing a place for these annual celebration gatherings. With the park open year round this is a great place to come and enjoy!